Over the last three decades, we have built up strong sales and service network in Southeast Asia and China with responsible local partners who contribute to the growth of various industries,dedicate to providing a high level of products and services. 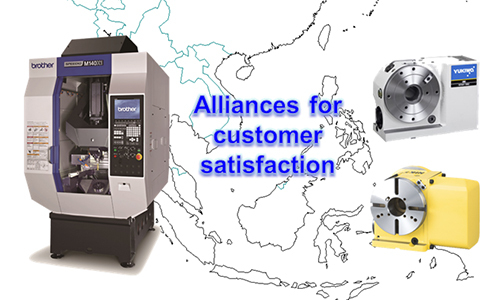 Our business partners as a machine tool distributor based in Hong Kong, Singapore, Malaysia and the Philippines provides superior services with technical knowledge and skills that have been developed through long-term service activities. Our role is to back up those valued partners through facilitating an international transaction, coordinating export logistics of CNC machines and the peripheral equipment in accordance with export control legislation. Brother SPEEDIO Series is BT30 CNC vertical machining center, providing high productivity with high accuracy in continuous mass production. NC rotary tables and tool systems that can contribute to the enhancement of productivity and raise the versatility of vertical machining center.